Following the long term evaluation of the Optare Metrodecker with First Bus in Rotherham (B&CB 1384, 24 June 2016) which both parties agreed delivered significant and positive feedback, a further partnership between the two organisations has undertaken a long term evaluation of the Euro6 Metrocity 12Tonnes GVW single decker on Red Arrow routes in Halifax. 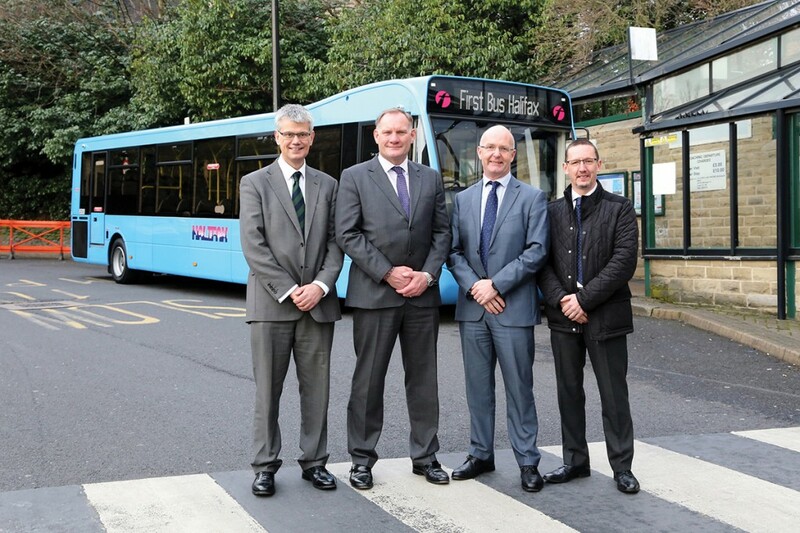 (LtoR) Robert Drewery (Optare), Graham Belgum (Optare), Mark Munday (First Bus) and Mick Campbell (First Bus) mark completion of a successful demonstration partnership in Halifax Bus Station. The interior of the Metrocity is functional but light and airy. A single seat is provided ahead of the front offside wheelarch. 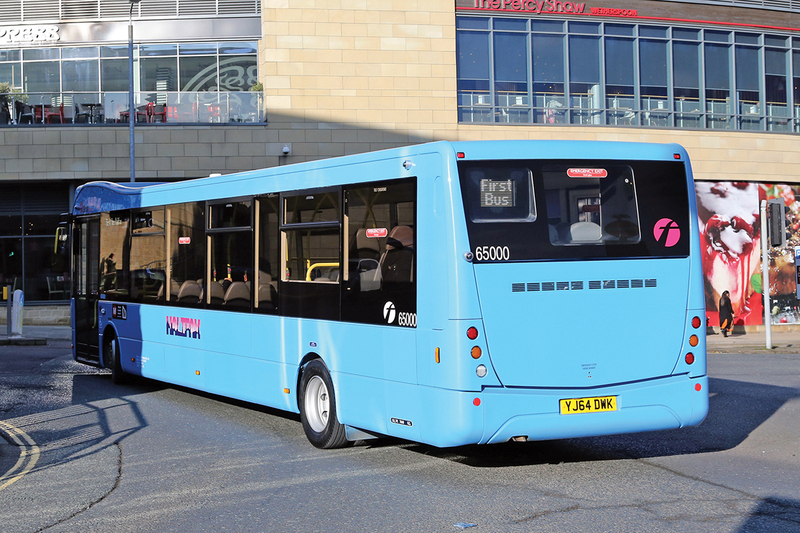 Both Mark and Optare President, Graham Belgum, referred to the partnership between the companies to stage the evaluation and praised the team involved, recognising specifically the engagement of the operations team at Halifax. 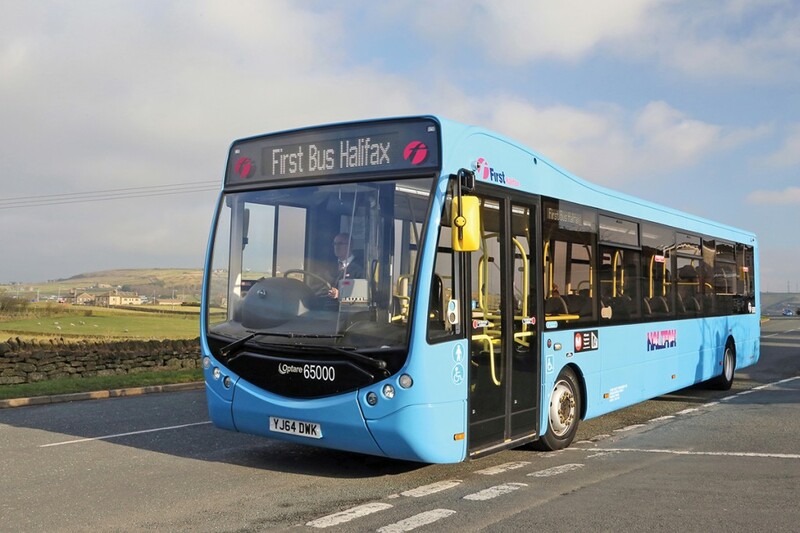 The process was managed for First Bus by Systems Engineer, Mick Campbell, whose role included a monthly meeting in Halifax with Optare to review operational and engineering performance. Mick reported positive feedback from a maintenance perspective, particularly in respect of component accessibility which minimised time wasted during routine servicing. The team at Halifax were also responsible for successfully putting the vehicle through its annual test. From a driver’s perspective, many of them commented positively on the ability of the Allison transmission to deliver power when needed in Halifax’s hilly terrain. The Euro6 demonstration vehicle evaluated in Halifax was built in 2014 ready for Euro Bus Expo. It is an 11.52m long vehicle to provincial single door specification with provision for a single wheelchair passenger. 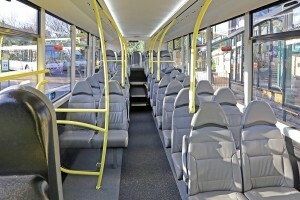 Within a 12,000kg GVW, it can have a maximum capacity of 60 passengers, with 41 seated, 32 of them on grey E-Leather trimmed Isri Civic V3 seats together with five seats across the rear, three tip-up seats in the wheelchair bay and a single seat on the forward side of the front offside wheelarch. Luggage trays occupy the rest of the front offside and all the front nearside wheelarch tops. The Metrocity features a small central window at the rear. It is equipped with a Mercedes-Benz OM934LA 5.13 litre four cylinder engine developing 130kW (174bhp) with Euro6 achieved through EGR and SCR. Power is delivered through Allison’s T270R Generation 5 six-speed fully automatic transmission with integral retarder to an Albion 8.20 single reduction rear axle. The front axle is an Albion F48. The wheelbase is 6.52m and the vehicle displays an unladen weight of 7660kg. For the demonstration, in addition to local standard ticketing and cash handling equipment, it was equipped with a number of First specific modifications including door sensitive edges, five second door close delay, an assault screen and Greenroad driver monitoring. It has retained its interior layout as built although to meet current First Group specifications, it would require a buggy bay in addition to the wheelchair bay. First Halifax’s Red Arrow services 521/2/3 provide a frequent link between the town centre and the housing estates of Ovenden and Illingworth on the Pennine plateaus north of the town. In the six kilometre journey from Halifax bus station to Illingworth, the climb is almost continuous with the routes’ highest point nearly 200m above the departure point. The routes encompass a wide spectrum of roads, bleak and windswept stretches on the edges of the estates, wide boulevards through them and congested narrow approach roads as well as town centre streets. With the frequency of services provided by both First and its competitors, the switch to Euro6 operation is a key aspect of reducing air pollution levels in critical areas along the route. First badges and Halifax branding have been added to the Metrocity’s blue demonstration livery. The Red Arrow services are normally operated by 2015 Wrightbus Streetlites supported by a number of 2013 Euro5 Wrightbus Eclipse bodied Volvo B7RLEs. Both vehicle types carry a similar Red Arrow branded livery featuring a red roof and front end on the current first livery. One of the Streetlites was selected as a direct comparitor to the Metrocity in matters such as overall fuel usage. The Metrocity’s overall performance is reported as being a match for its comparitor. On the media demonstration run, the Metrocity showed its ability to cope easily with the Red Arrow terrain, albeit lightly loaded. President, Graham Belgum sees the building of partnership with operators as a key aspect of Optare’s future development plans for the UK and considered that the hard work both parties have put into this evaluation reflects positively on that objective. Feedback will flow into the company’s ongoing product development programme. 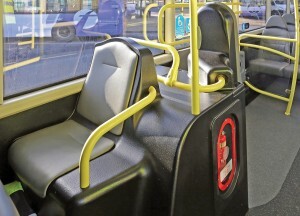 Production at Optare focuses on the versatile Solo, Versa and Metrocity products for UK and international customers. Graham expects the company to complete its final Euro5 vehicle for the UK by late summer for registration before October although Euro5 production will continue for export markets. Euro6 vehicles are reported as proving very reliable from the manufacturer’s VOR monitoring and is set to further improve with new developments from Mercedes-Benz in the software and processes for DPF regeneration. Double decker development is focussing on the homologation of the electric Metrodecker in the coming weeks prior to commencement of its demonstration role. 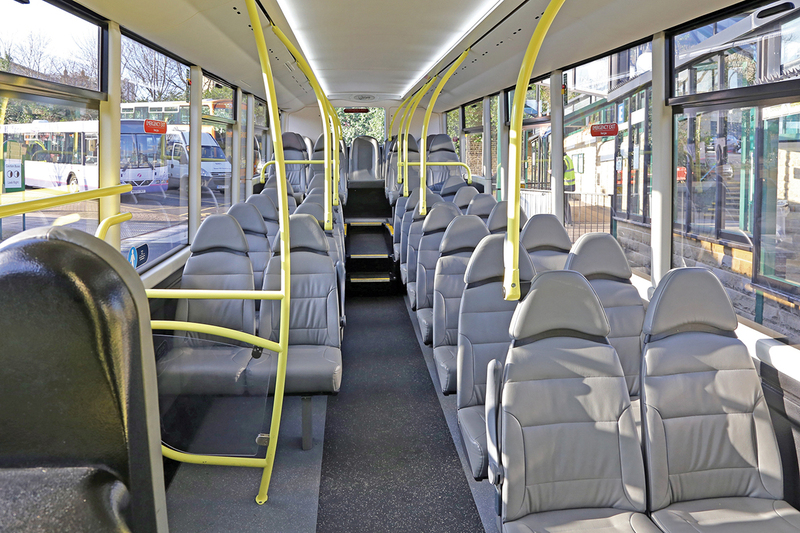 The Metrocity at Euro5 has proved successful with operators, particularly in Wales and the Euro6 version looks an attractive proposition with plenty of opportunity to customise the interior to enhance the customer experience. Partnering with First Bus in the evaluation process provides significant benefits to both parties and will continue as the Metrocity is due to move to First Hampshire and Dorset for in service assessment in an entirely different operating terrain. First Bus is currently evaluating its new vehicle requirements for 2017 before going out to tender.